UPDATED 2:46 P.M. ET (U.S.A.) And to think a cheerleader for AdSurfDaily once boasted online that Megalido was “offshore” and therefore safe from government meddling, after earlier suggesting that ASD members who did not support the company after Ponzi allegations surfaced perhaps would get dragged off in handcuffs while supporters remained free. Could an adult be so out of touch he actually believed law enforcement did not have a clue about how fraudsters operate and had no experience at all investigating intricate and elaborate crimes that touched all 50 U.S. states, Canada, the Caribbean and other parts of the world? The plain answer is yes. Even as the apologist chanted, however, the FBI was in the seventh year of one of the most intricate and exhaustive probes in its history, a history that dates back to 1908. Operation â€œShore Shellsâ€ included probes into 40 separate schemes and, to date, has resulted in 40 convictions, the agency said. The FBI and partner agencies chose the “Shore Shells” name because the probe originated on New Jersey’s Atlantic coast and involved “fake” companies or “shell” firms. Targeted in the probe were CEOs, stock brokers, CPAs, financial advisers and attorneys who conspired to pump up the price of penny stocks with bogus news releases, false postings on Internet forums and fraudulent information delivered in newsletters, the FBI said. St. Petersburg, Fla. Gordon was sentenced in New Jersey to 20 years in prison, after a jury found him guilty of conspiracy to commit securities and wire fraud and conspiracy to commit money-laundering. Investors lost $15 million in the pump-and-dump scheme, which included company names such as TeleServices Internet Group Inc. (TSIG) and Phoenix Information Systems Inc.
fraudulently received shares that were laundered in Canada and the United States. “Afterward, the ill-gotten proceeds were often laundered by wire transferring those funds from the brokerage accounts to an attorney trust account located in Denver and then dispersed to the co-conspirators,” prosecutors said. Investors dump their life savings into pump-and-dump schemes, which deliberately are designed to be elaborate to line the pockets of insiders. Now the FBI has disclosed some details about the victims — the people the AdSurfZone poster would have ASD members believe were the “Bad Boys” for not cheerleading for the international scammers. A husband and wife who both developed dementia during the probe. FBI agents spent hours with the victims and their family members at a nursing home, while also meeting with the victims’ accountants to reverse-engineer their losses. The real “Bad Boys” have been ordered to pay more than $130 million in restitution. Others convicted in operation “Shore Shells” include Gary Brown, 61, of Sarasota, Fla.; Joseph Morgan, of St. Pete Beach, Fla.; and Gary Brown, also of Florida, for their roles in a scheme involving a company known as Skylynx Communications. Brown pleaded guilty to conspiracy to commit securities fraud, wire fraud, and money laundering. His sentencing is set for for May 7. “At his plea hearing, Brown admitted that beginning in May 2002 and continuing through October 2005, he operated a sophisticated scheme, involving more than five co-conspirators, which used deceptive and manipulative practices in connection with the fraudulent issuance, purchase, and re-sale of shares of stock of Skylynx Communications,” prosecutors said. More than 50 Skylynx investors were defrauded. Brown admitted that he conspired with Morgan, who already has been sentenced to two years in prison, and McPhee, whose sentencing is pending, prosecutors said. Brown agreed to forfeit about $650,000, as part of his plea. 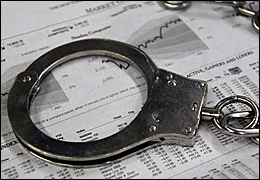 Read more about operation “Shore Shells” and pump-and-dump schemes. The number of companies, reverse mergers and name changes are enough to give me a headache. It is intended too. They do it so it makes it harder for law enforcement to track them all down. They are hoping they will just give up since the trail keeps twisting and turning, going down rat holes, and then into more tangled entities. This time they figured wrong. Patrick: Did you really meant to say 1908, or 1998 in the article? >> Patrick: Did you really meant to say 1908. Indeed, the FBI speaks about its 1908 beginnings on the agency’s website. Let’s hope it’s not followed by the dreaded dry heaves — and, perhaps, projectile vomiting. And people actually cheerlead for this stuff, even as banks are failing, charities are getting robbed and widows with dementia are getting fleeced.